Rena and her friend Rena is a large white dog that lives outside with a herd of sheep on a ranch east of Marbleton. Someone may have picked her up mistakenly thinking she was lost. 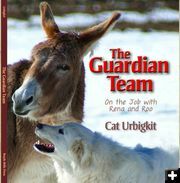 The Guardian Team Rena and her burro friend, Roo, were just featured in a new book describing their lives as livestock protection animals on a ranch in Wyoming. Wyoming's most famous livestock protection dog, Rena, is missing. Rena was "picked up" near her home on Wyoming Highway 351, 12 miles east of Marbleton, on Friday afternoon the day after Thanksgiving, November 25th. Her owners, Cat and Jim Urbigkit, hope that this was a case of mistaken "rescue" and not an intentional theft. Rena is a four-year old, 130-pound all white Akbash female livestock guardian dog. She's the star of a new children's book that was released by Boyds Mills Press two months ago, The Guardian Team: On the job with Rena and Roo. Rena would have been fairly easy to load into a vehicle – as an ambassador dog, she was intentionally socialized to people. She visits libraries, schools, fairs and attends special events to educate the public about livestock guardian animals. Rena has met more than 2,000 Wyoming schoolchildren, and dozens of state policy makers as well. When not working as an ambassador, Rena also tends to sheep at the Urbigkit's Paradise Sheep Company. The Urbigkits were moving sheep from one pasture to another when Rena went missing last Friday afternoon, Nov. 25. Rena's family, and the children of Wyoming, want Rena back. Please call 307-276-5393 or 307-360-6670 with information about her whereabouts. Rena with her sheep herd Rena's job is to protect the flock of sheep from predators. Rena Rena is very friendly towards people. She often is taken to visit school children, libraries, fairs and special events to educate the public about livestock protection animals.